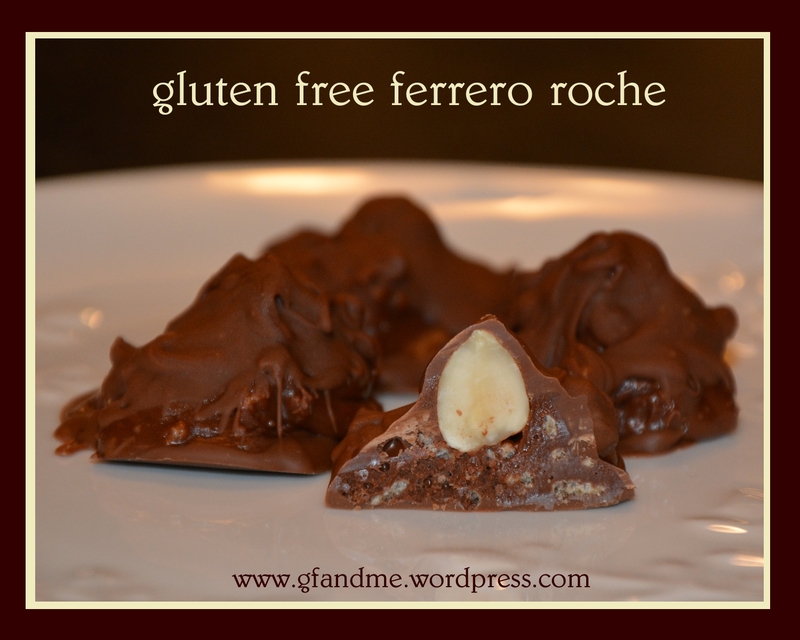 Been missing Ferrero Rocher since you went gluten free? Well Geoff has. It used to be one of his holiday favorites, so this year we decided to try to make some that were gluten free. The results were incredible – although perhaps not as pretty as those little gold and silver foil-wrapped balls of chocolate! We did, however, feed them to some unsuspecting gluten eaters who all said they liked these even better than the original. In fact, they ordered requested we make more! If you like nutella and chocolate then this is the recipe for you! In medium bowl, mix together the Nutella and the lightly crushed rice Chex. TIP: To lightly crush the Chex, just pop them between your thumb and index finger. Drop the Nutella mix by spoonfuls onto the parchment. Press one hazelnut into the top of each mound. Place these mounds in the freezer for about thirty minutes to make them nice and firm. Before removing the mounds from the freezer, melt your chocolate in double boiler or microwave. TIP: Microwave on half power for 2 minutes. Remove and stir until smooth. Using a small fork or pick, dip each mound into the chocolate and set back on the parchment. Sprinkle with chopped hazelnuts if using. TIP: We used President’s Choice Milk Chocolate Chips which taste fantastic; however, the melted chocolate was a bit thick for simple dipping. Our first batch of candy turned out to be the size of fast balls and the ratio of chocolate to filling was off. To compensate we opted to paint the chocolate onto the mounds. First we spread small circles of chocolate onto some parchment – just large enough to cover the bottom of each mound. Then we set each mound onto its own circle. Finally, using a pastry brush, we painted the chocolate onto the candy filling. The results may not be the prettiest, but they were extremely tasty! However you do it, once you have coated the filling with chocolate place candy in the fridge to set. Store in an airtight container in the fridge. This entry was posted in Baking, Drinks & Desserts, Recipes and tagged candy, celiac, chocolate, Christmas, GF, gluten free, nutella, rice chex. Bookmark the permalink. These look better than the original! Gluten or not, yummy. Thanks! And they are easy to make too. Reblogged this on Health Blog for College Students. Thanks so much for the reblog. Hope your readers enjoy these as much as we did! My sister would love these. Thanks..
Yum! I’d prefer this to the original! Well, if you like chocolate and nutella, you’re in for a treat then! what a genius idea!!! I can’t wait to try these. thank you! Oh I used to loooove ferrero roche as a kid. My grandmother would always have some around when I visited. Nowadays I just find them too sweet. But I have never thought of making them myself. What a great idea! Thanks. And depending on the chocolate you use you could make them less sweet. I haven’t had Ferrero Rocher for years. These will be great to add to my Christmas candy tray. Thanks for the wonderful recipe. Rice Chex are like tiny squares of shredded wheat or shreddies but made with rice. I would think that puffed rice would do the trick – as long as it doesn’t lose its crispyness. Let us know how it goes if you do try it. Would love to know. Fabulous! Ferrero Rocher is one of my all time favorite holiday treats! Ours too. Hope you enjoy these as much as we do! Had to reblogging! At least, I hope I reblogged. Still learning. Genius! These sound perfect, I have to admit Ferrero Rocher were my FAVORITE!